First airplane rides can be scary and exciting. Luca Lashes is getting ready for his first airplane ride. The ninth book in the series finds Luca Lashes, the brown-eyed boy with the magic eyelashes, going on his first airplane ride with his Mommy and Daddy. 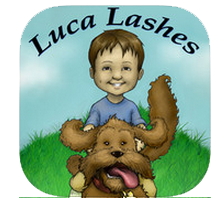 Children learn to be brave with Luca as he blinks his magic eyelashes and makes the scary plane ride fun and exciting. Note to Parents: This is a multilingual, educational eBook that continues the Luca Lashes series about children experiencing their ‘firsts.’ You can read and listen to the stories in Chinese, English, French, Italian and Spanish. The eBook includes suggestions for parents. The focus of the series is Luca Lashes, a highly relatable character. Luca Lashes and his First Airplane Ride is written for children under four. To help children learn to read, individual words are highlighted as the story is narrated. By combining original text with terrific artwork and audio, this e-book will be enjoyed by beginning readers of all ages. Throughout the story, key concepts are emphasized to help children through new experiences. It is never too early to fall in love with language! Luca Lashes, The Brown- Eyed Boy with The Magic Eyelashes—for FREE, so you can meet Luca and see what our series is all about. Make sure to download it! Book Review: Dance to the Beat of Sage’s Song! Dana Alma, a contributing book reviewer for Living Green with Baby, is a reading advocate. Her book choices focus on children's books that nurture mental and emotional growth. She's a mother of 4, who has passed on her love of literature to her children. She enjoys volunteering at schools and local libraries to share stories with children. In addition she's the editor at Readaholics Anonymous, since 2010. This avid reader and book enthusiast is a strong supporter of authors she believes in and takes that same passion outside of cyberspace to share with special groups, libraries, and just about anywhere books are mentioned. She is also publishing market junkie and an active media consultant, specializing in book promotion, advertising, and other online projects.